Most Merciful shows mercy to those who have mercy on others. Show mercy to those on earth, and the One above the heaven will show mercy to you. 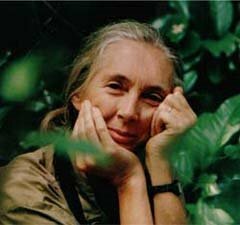 Dr. Jane Goodall is a dedicated primatologist and founder of the Jane Goodall Institute whose mission is to advance the power of individuals to take informed and compassionate action to improve the environment of all living things. We live in dark times: we are destroying Mother Earth and many people have lost hope. So it is important to highlight all that is being done to heal our planet. More and more of us are protesting the magnitude of the insults perpetrated against people, animals, and environment, the selfish squandering of our children’s future all in the name of economic progress. Thousands are joining together to tackle problems of poverty, the unsustainable life styles of the elite and the destruction of the environment. Through programs such as the provision of small loans for the poor, empowerment of women, organic farms, farmers markets, the purchase of farmland and wilderness to prevent development, and alternative energy technologies, the quality of life can be improved and people can better live in harmony with nature. And nature is very resilient. Most importantly, we are realizing that we as individuals truly make a difference and are thinking more carefully about the effect of our actions. This lies at the heart of the Jane Goodall Institute’s youth program, Roots & Shoots: roots make a firm foundation, shoots seem small but to reach the light can break through brick walls (all the problems we have inflicted on the planet) to make this world a better place for all. The thousands of groups in 95 countries select hands-on projects that help animals, the environment and the human community.